Irving Park is in the seaside city of Victoria, one of thirteen communities that form the Capital Regional District of British Columbia. 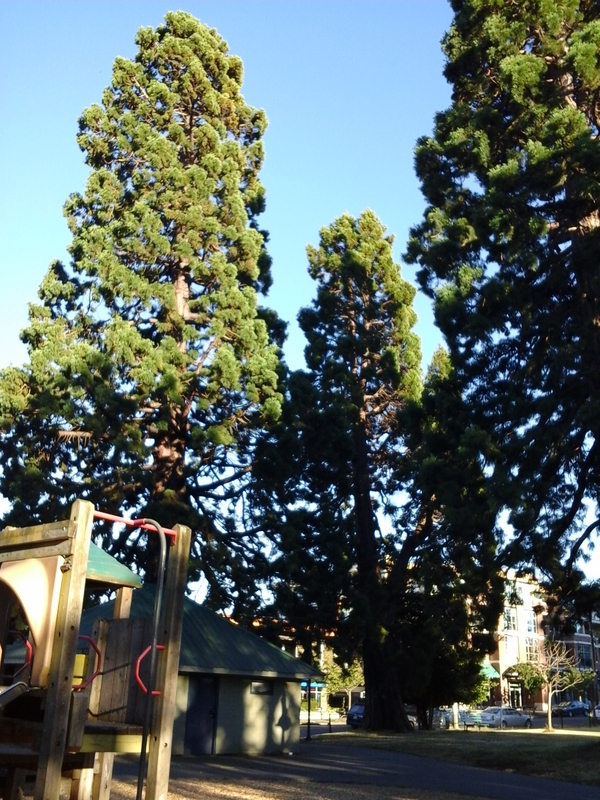 Sierra redwoods, horse chest nut and big leaf maple trees provide ample shade for the playground in James Bay’s Irving Park. This hectare size park also has twenty one Japanese cherry trees planted along the curving gravel pathway that leads toward the discrete labyrinth located on the southwest section of the parkland. The cherry trees bloom spectacularly in late spring which is a wonderful time to walk the meditative seven circuit pathway. A paved seventy five meter foot path lies diagonal through the park to connect Michigan Street with Menzies Street. The playground is circled by a twenty-five meter pathway. Located near the shopping area in the James Bay community of the City of Victoria, B.C., Irving Park was named after Captain John Irving whose family home was built on the property in eighteen eighty four. The park was originally named James Bay Park when it was formed in nineteen forty four; James Bay is the located in front of the Empress Hotel about four blocks north along Menzies Street. This park was renamed to commemorate Captain Irving. The playground has toddler sized swings and climbing apparatus. There are picnic tables and benches. The toilets are located next to the colorful mural painted on the shipping container. This centrally located park is close to Beacon Hill Park, Thunderbird Park, Centennial Park, Quadra Park, Laurel Point Park, Fisherman’s Wharf Park, Ogden Point Park and Holland Point Park. The green spaces near here include Kingston Superior, James Bay Community Gardens and the Parliament Buildings. This is a wonderful place to explore in your backyard. Irving Park can be reached from the Trans Canada Highway. Continue along the highway as it becomes Douglas Street. Continue along through downtown to Superior Street. Turn right onto Superior Street and then, in about four blocks, turn left onto Menzies Street. The park is located on the corner of Michigan and Menzies streets. There is limited roadside parking near Irving Park. City buses travel along both Superior and Menzies streets in the James Bay area of Victoria, B.C.